I finished these pants back in May but have been slowly finishing up this second Lina Tank over the last 3 months. I waited to show them off together since they pair so well. I’m trying to be more conscious of making full looks when I’m sewing. It really makes my wardrobe mix and match so much better. Check out these awesome capri’s too! 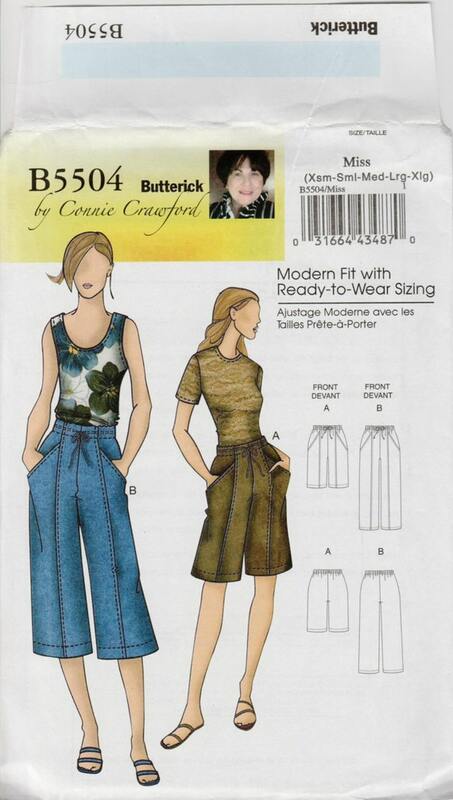 They’re a Butterick by Connie Crawford pattern, B5504, that I found on Etsy at The Perfect Pattern. 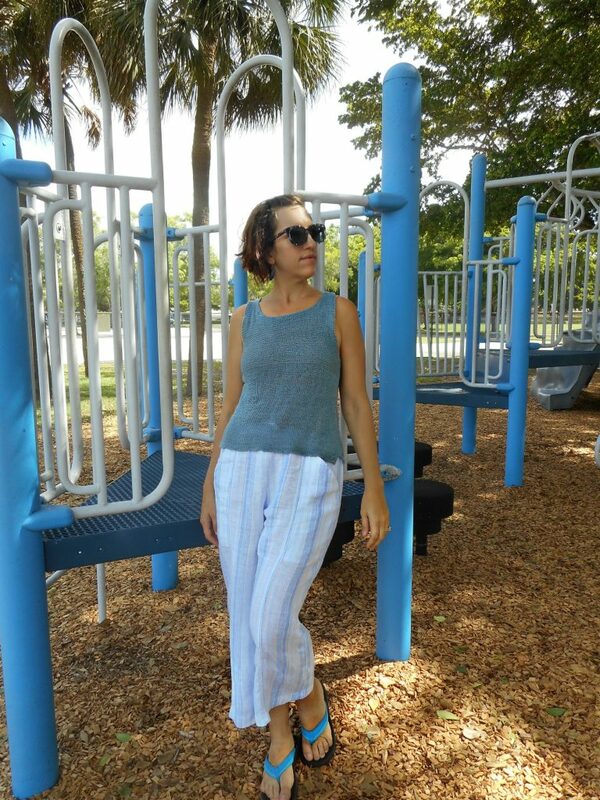 I’m always on the lookout for a good pant pattern and the pockets and front seamlines are fab on this pattern. The tank is my second go at the Lina Tank in Sparrow Linen this time in Blue Spruce, both from Quince & Co. I’ve been knitting this tank up for ages. The last few inches wore me out so I’m taking a break on knitting again until the fall. The pants were an easy sew. I checked the fit against my sloper and adjusted the crotch a bit but since this is a drawstring waist I didn’t need much changed. I cut these in a size Medium (10-12). I very carefully cut these out of my fabric to keep my grainline straight and my stripes aligned. The fabric is an almost sheer and very soft weave Georgio Armani Linen from Michael Levine in white, light blue and grey blue stripe. Perfect summer weight. The only part I really don’t like on this pattern is the waist. The drawstring is just not cutting it. 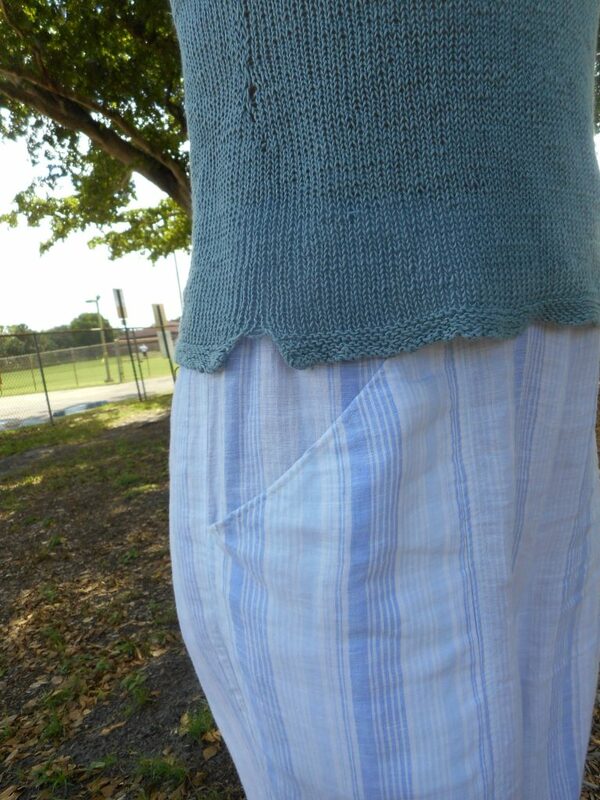 It bunches up at the pockets because it gathers the entire waist. I prefer a fitted waist and may redo this one for a flat front when I feel like ripping out all those seams. The tank is exactly the same as my first Lina but knitted in a smaller size. 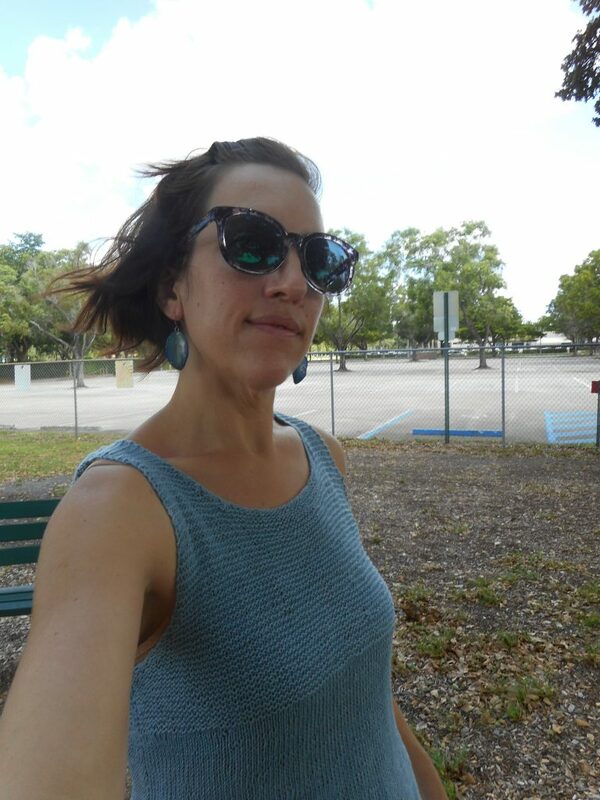 I went with the size small but still had to raise the shoulder seam since it starts to hang lower very quickly in our Florida heat. I’m so happy I have a tried and true knitting pattern that fits my climate. 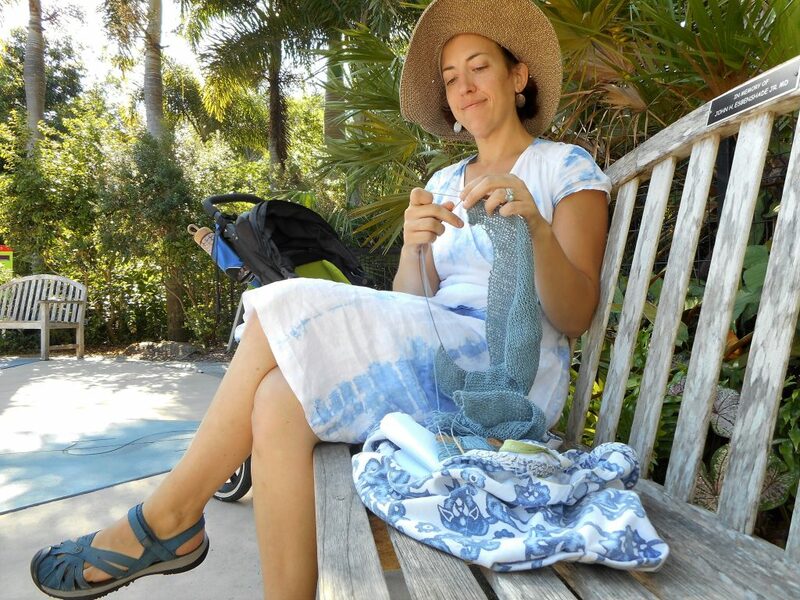 I really missed knitting but could never find anything really Florida appropriate. This linen yarn really is lovely to work with and wear. The color of this grey blue is beautiful. It almost exactly matches my eyes. 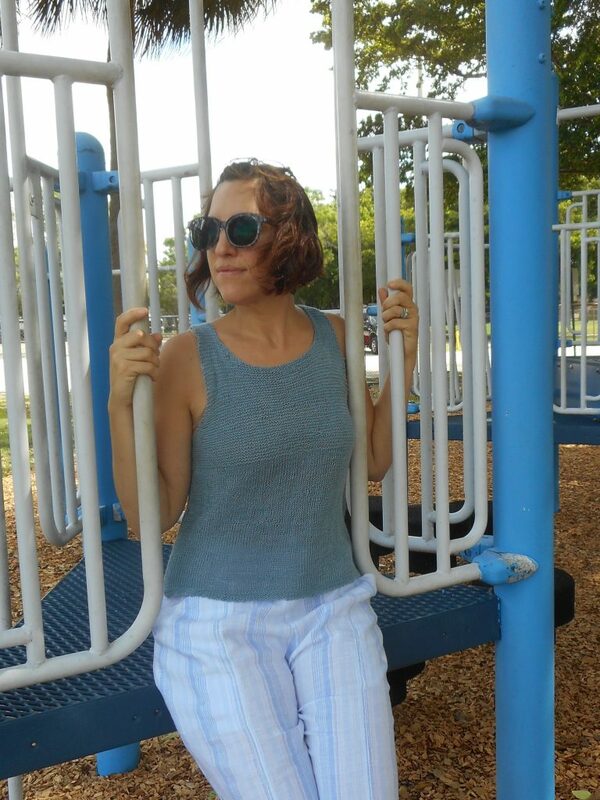 I took these pics at the playground with the kiddos. It’s been really hard finding time for the blog and taking pics this summer. Both kids are home with me for the summer and keeping them entertained (with limited screen time) when it’s so hot is a full time job! Luckily I found the best shady playground near our new home which has really helped keep these two active. I have a ton of finished makes that just need pics that I can’t wait to show off. I made another Sophie Swimsuit (Closet Case Files), Mommy and Me matching Colfax Dresses (True Bias) in a purple Liberty print, and an awesome knit t-shirt dress from a Marcy Tilton fabric. Today I’m finishing sewing up a pattern hack of the Capri’s shown here and the Holly Pant (By Hand London) in a rust colored Organic Cotton Twill. Even better than the rust one! PERFECT color! Worth all the effort! I do love this color! Thanks Mom! 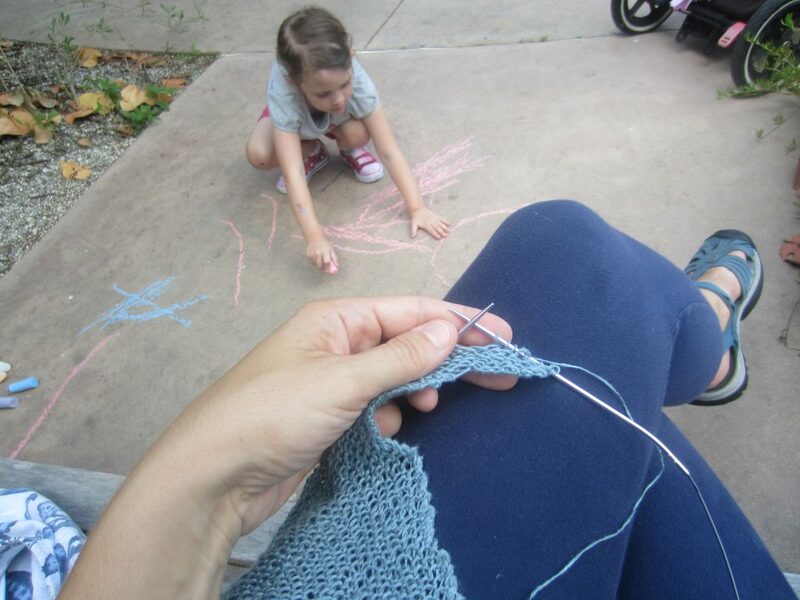 And you knit too! Impressive. That’s a lovely combination. The colors are gorgeous and you did a beautiful job! I’ve stayed away from drawstring pants for the very reason you mentioned, but I don’t see any bunching up on you – maybe it’s the lightweight fabric, but they look fantastic! Perfect way to look fresh and stylish for those hot summer days or nights! Hello + Welcome to Sew Pomona! Hi! I'm Rebecca, artist, seamstress & beginning natural dye artisan. 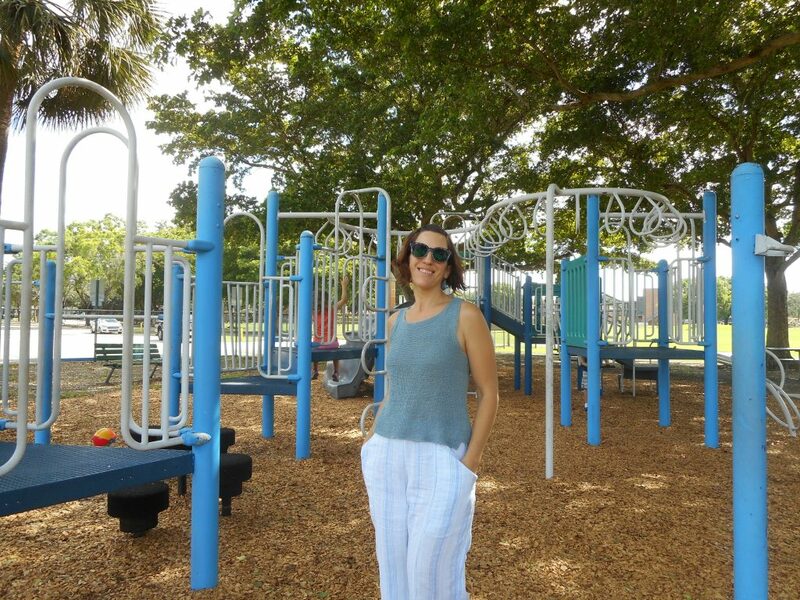 Enjoying life in sunny SE Florida with my husband and two sweet kiddos! 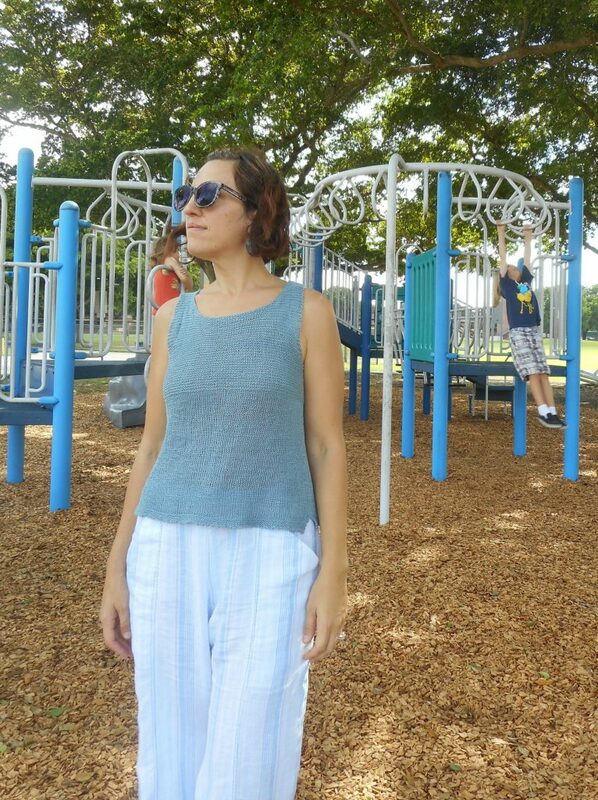 Follow my sewing adventures as I craft a beautiful and eco-friendly wardrobe for myself and my family. Follow Sew Pomona by email and never miss a post. 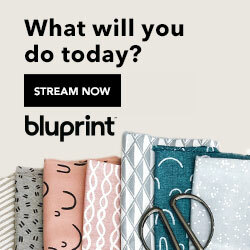 Visit Sew Pomona's profile on Pinterest. 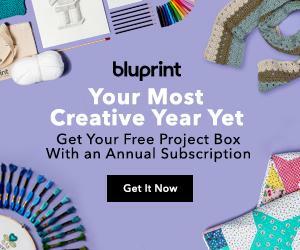 At Sew Pomona I work with select advertising partners and use affiliate links in blog posts on occasion. I make a small commission whenever items are purchased which helps to keep this blog running. I only recommend products that I use and love myself. Thanks! Share book reviews and ratings with Rebecca, and even join a book club on Goodreads.